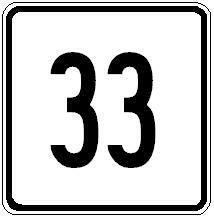 Massachusetts State Route 33 is a short north-south highway in the Metro-Springfield Area of Western Massachusetts. It runs from MA St Rt 141, at Springfield, to MA St Rt 116, north of Holyoke. Info on MA St Rt 33 is broken down by county below.